After a wonderful 6 day vacation in California my wife and I headed back to Tennessee but my wife didn’t come home alone, she came home with a rapidly changing fever, body aches, headaches, and nausea. In all honesty “Swine Flu (Type A Novel H1N1)” didn’t even cross my mind. Considering we traveled back to Tennessee from California on two different flights it would be easy to understand contracting some kind of illness from being around so many people but no one thinks it can happen to them. My name is Robert Barr, and I voted for Barack Obama. I voted for President Obama because the Republican Party of today is not representative of the Republican Party I grew up with. You see, I was a Republican, and I voted for Bush – once. But somewhere along the way the GOP stopped caring about my vote. Maybe because I am a conservative that believes in a strong military but also thinks that a woman has the right to chose, or that there is much to be gained from stem cell research and we should fund it with the full throated support of the U.S. government. Maybe it’s my northeast liberal upbringing, but I could care less if a man wants to marry another man, for we should all know the trials and tribulations of love and marriage. And I think the GOP knows that they need to be a bit more progressive too, but they also know that that can never happen as long as the face of the party remains that of Rush Limbaugh’s. Because Limbaugh and his ilk and their never ending rants against anyone who isn’t so far right that they fall over is what has pushed me into the loving arms of the Dems. I mean, it’s easy to say you believe in everything one party believes in right? You don’t have to think, you can just say, hey, I’m a Republican, so I have to think this way. 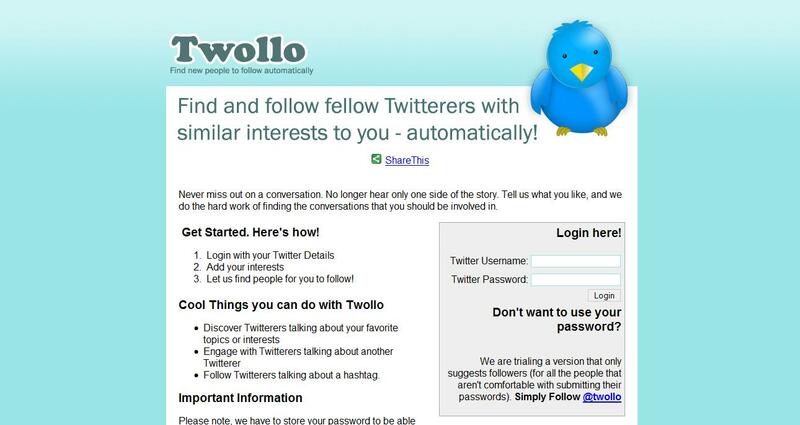 UPDATE: 2/25/2012 | Twollo, the application mentioned in this article apparently is no longer active. I thought this was pertinent to mention so you don’t potentially waste any time implementing this approach to increasing your Twitter following. Like most people who start out on Twitter I was left with the question, how do I increase the number of followers or more specifically my reach on Twitter? There are a number of ways to increase your following but I haven’t come across any methods as easy as the one I’m about to explain. Increasing your following is completely useless if you don’t have the personality or originality to keep your followers interested in what you have to say. Before diving much further into this creative little tactic I should explain that I am fairly new to Twitter and I undoubtedly have a lot to learn which I will continue to do on a daily basis through research and trial and error (hopefully less error). Seeing how I am not a Twitter power user and make no claim of knowing all of the in’s and out’s of Twitter I am writing this for those of you who are new to twitter trying to find a way to get your profile started in a positive direction. One thing you’ll learn very quickly is that there are a lot of third party app’s, websites, services that can interact with your Twitter account; with this strategy we are going to take advantage of two of those tools to jump start your Twitter following. Do you Twollo? That’s a question you need to ask yourself. If the answer is no, It’s time to enter twollo.com into the address bar of your favorite browser to take a peak. 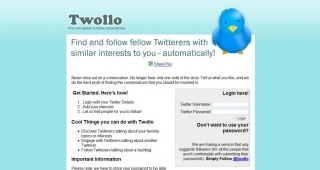 Twollo is an auto follow program that will follow a set amount of people who are tweeting about any keyword(s) you enter. You can set the amount of people twollo will auto follow for each keyword. Do you see how this could be useful? Of course you do but don’t get carried away. A web hosting control panel is a web based control interface that helps to ease all the admin work on a hosting account. With the control panel you can easily manage domains, email accounts, install software, backup website data, manage website files and a number of other things needed to operate a website. If we were to compare a website to a human being the web hosting would be the physical body and the control panel would be considered the respiratory system. Every human needs to breath to live. There are many different brands of control panels available; cPanel is the most popular one while vDeck tends to get overlooked. CPanel has been such a dominant force in the market that most people aren’t aware of the existence of other control panels like vDeck. It’s likely cPanel’s popularity that tends to blind people keeping them from judging rationally. No doubt cPanel is a great control panel but vDeck has made up some ground with their latest release, vDeck 3.0. There are numerous articles that cover the process of transferring a WordPress blog from one server or host to another but I’ve found that most of them left me asking questions after reading them. I am a very visual person and hope the following article and images help you get your WordPress blog transferred successfully. The following article was compiled from firsthand experience of transferring two WordPress blogs from a Godaddy hosting account to my own dedicated linux server. Make sure and take a side in the rivaly: Blogger vs. WordPress. Which is the better blogging CMS / Platform? From hearing that Mint.com had released an iPhone app and opening the app for the first time, I think I had let about 3 seconds pass. If you’re one of the 500k people who use Mint and also own an iPhone, I suspect you had just about the same reaction. The funny thing is that I only started using Mint about a month ago and I’m completely in love with it. The fact that all I have to do is open the app and I can see all my up to date financial info… is astonishing. 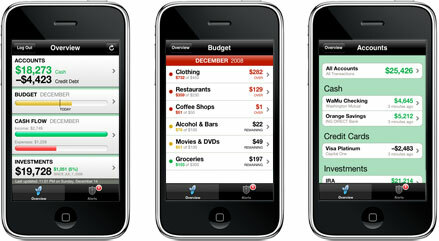 I had written a post a while ago about some concept iPhone apps I’d love to have, and an HSBC app was on that list. My reasoning was that I hate having to spend so long each time I log into my bank account online. I thought with such a flexible platform such as the iPhone, there much be a quicker way. Unfortunately there wasn’t a way to connect directly to my bank account over the iPhone… keyword being “directly”. Mint’s iPhone app allows me to indirectly view real time account information including the available balance, and transation history. So instead of creating a mock-up of what an HSBC iPhone app might look like, I’m going to pump up Mint’s tire here a bit and give them a review.